I have owned a few bikes in my 45 years but my 79 is my baby. Shes easy to maneuver around, I can pick her up should she fall over and shes got the balls to keep up with the biggest of the bikes. 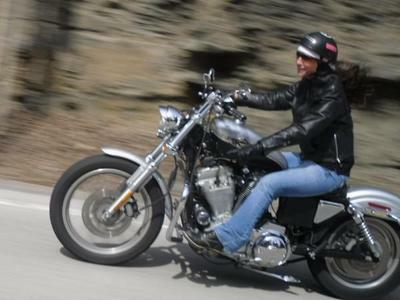 I am small, 5'5", 120 lbs and although my sportster was light enough for me the center of gravity was just too high. I also own a Vstar right now...but honestly it never leaves the garage only because i just cant let my baby sit. As I said, Im a 45 year old female.My kids are grown.My guy rides also but hes mostly into other things,,hunting, fishing etc. I have been riding my own for about 7 years now. I love to ride local but I will go distance without an issue. I grew up on bikes, my parents rode so its always been a part of who I believe I am. If there are any other women in the area, please drop me a message. I thought of starting a chapter of one of the larger groups here but I am not sure there are enough female riders up here. ( I live in Fla part time also. )I have too much time on my hands...I raised the family...now its my time.I would love to ride from here to Fla and just have an adventure!